This stylish holiday home is located in Hastière, 17 kilometres away from Dinant, in the Ardennes. 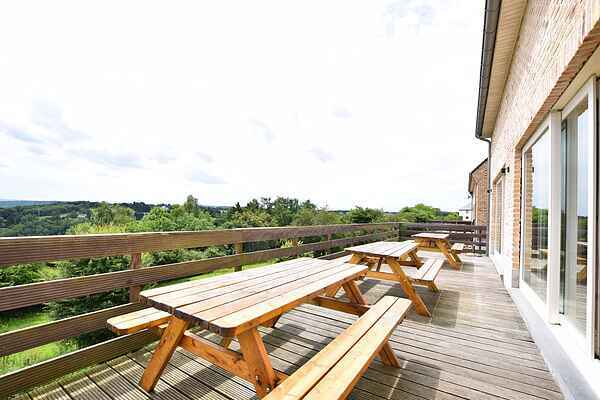 The holiday home offers stunning views of the Meuse valley; on a clear day you can even see as far as France! This newly built holiday home is very spacious and has all the luxury you may need. The house has been nicely decorated. The hallway takes you through to the attractive living room with lounge area and a large dining table. The wide patio doors in the living room give access to the spacious terrace, which is a great place to sit and enjoy the view. Would you rather play a game of table tennis or table football? You can find all this in the separate activity area! This holiday home is aimed at families. Sporty holiday makers will love this region. Hiking, mountain biking, cycling, kayaking or cross-country skiing; the possibilities are endless! But also remember to visit the attractive small Saturday market in Hastière. And of course, your itinerary should include a visit to Dinant (17 km) with its world-famous Citadel, France (within 10 km) or Namur (50 km).